Austin residents gather to vote at the Austin Public Library, George Washington Carver Branch on Angelina Street on Tuesday. 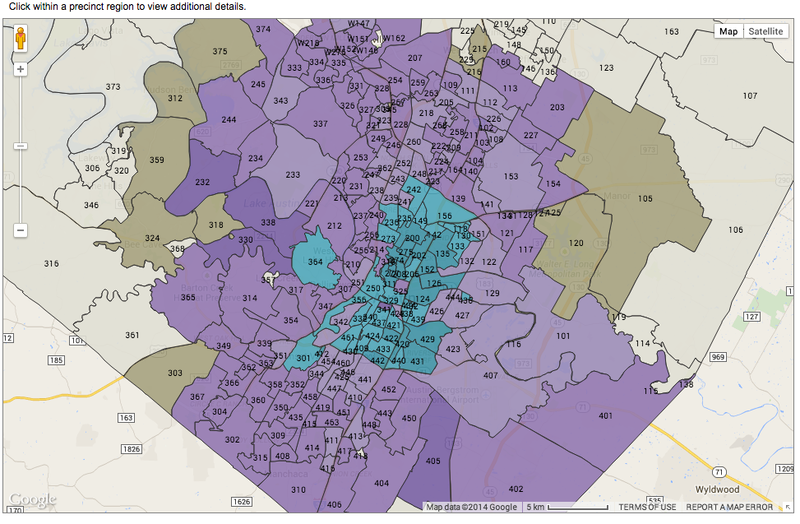 Results precinct-by-precinct for Austin's rail and roads proposition. Precincts in purple voted "No;" precincts in blue voted "Yes." Outgoing Mayor Lee Leffingwell doesn't appear to be very reflective about where things went wrong. When asked if he could have done anything differently to get light rail passed in Austin, Leffingwell said, "Not a thing. I wouldn't change one thing about how this proposition was put together." When asked why he thought the rail and roads proposal was defeated, Leffingwell said it was a result of "all this talk about taxes and affordability." 10:15 p.m.: Jim Skaggs of the anti-rail group Citizens Against Rail Taxes welcomed the results of the rail and roads proposition failing. "I think it's a great day for the taxpayers and Citizens of Austin," he said. So what sort of light rail line Skaggs would support? "Any rail system must be cost-effective," he said. "If a rail system is cost-effective, Yes, I could support it. The problem is, I do not see the the likelihood of Austin's density ever reaching the point where rail makes sense, because it costs significantly more than the alternatives like buses." Our Rail, a pro-transit group that was against this plan and the chosen route, also welcomes the results. "With this vote, Austin has rejected a bad urban rail plan," Scott Morris, the group's treasurer, says in an emailed statement. "It was the wrong route and it was formed by values that were not shared by our community. What we do share with those who supported this measure is a resolve in moving forward with true mobility solutions that make transit a ubiquitous part of life in our growing city." 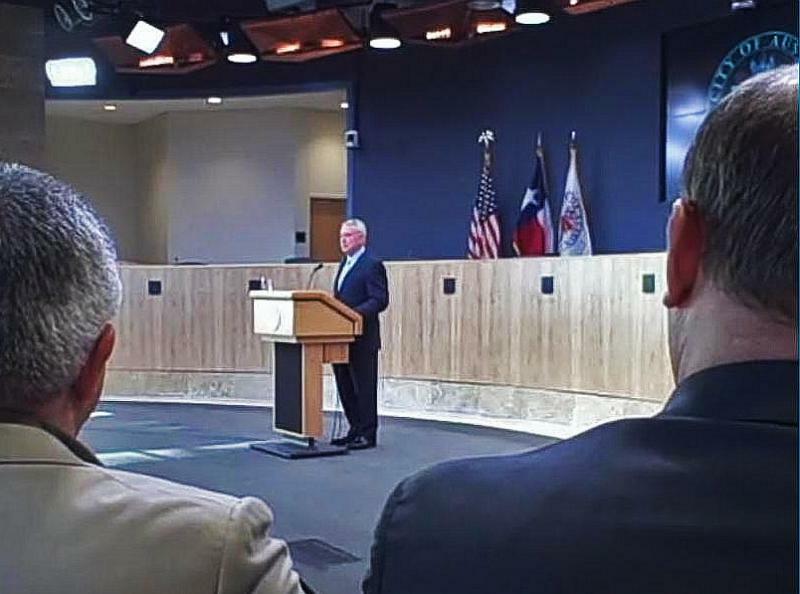 9:35 p.m.: "I think it's clear, based on the results of the early vote, that the rail and roads proposition is going down," says outgoing Mayor Lee Leffingwell, who oversaw the creation of the light rail plan and led it to the ballot. "I think it's a very serious setback for transportation infrastructure in Austin at a time when we sorely need it." 9:20 p.m.: Mayor Lee Leffingwell and the pro-Prop 1 group Let's Go Austin are conceding defeat for the rail and roads proposition. They say there simply isn't a way to make up the deficit from early voting, which had the proposal losing by 16 points. 9:00 p.m.: Early voting totals spell bad news for proponents of the rail and roads proposal. 58 percent voted against the plan, while 42 percent voted for it. We'll have more results as they come in. If it does fail, what does that mean for the future mass transit in Austin? KUT put that question to the candidates for mayor during a forum this election. The two leading candidates, Steve Adler and Mike Martinez, both said that the failure of Prop 1 wouldn't mean doom for mass transit in Austin. Adler and Martinez could be heading for a runoff, which means one of them would be mayor. "We can't build our way out of this," Adler said, noting the need for added density and infrastructure. "You know, if we did aggressively staggered work hours at the state, at the University of Texas, the Capitol, city government, county government, large employers downtown? We could dramatically change things." Martinez said that if the proposition fails, "we go right back to work improving Capital Metro, we go back adding bus rapid transit lines, and we go back to work on our road infrastructure, our sidewalks, our urban trails and bikeways. We don't have an option to sit and not do anything." 8:15 p.m.: There's several election night watch events for the various political groups pushing for and against the rail and roads proposal. Let's Go Austin, which likely spent over a million dollars pushing for the rail and roads proposition, is at Threadgill's on West Riverside. Outgoing Mayor Lee Leffingwell, who shepherded the rail plan from its very beginning to the ballot today, is there. On the other side of the Prop 1 fence is Citizens Against Rail Taxes, led by longtime mass transit opponent Jim Skaggs. They're gathering at The Park on South Lamar. And in the pro-transit, anti-Prop 1 camp are the grassroots groups Our Rail and AURA, who are holding a joint event at the Draft Pick on East Riverside. 7:30 p.m.: KUT spent some time talking to voters in line today to get a sense of why they chose to vote for or against the proposal. Melinda Ballew voted against it. "It basically increases the homeowner's tax. All these people moving in say, 'Oh, great, let's have it!' But they're not paying for it," she said. For an idea of how hard it was to decide on the proposal, you could talk to Michael Webber in Southwest Austin. "I'm really torn," he said, noting he's a transportation planner. "I actually voted against it. I hope it loses today and they come back with a better plan, and that one wins." Maxwell Parks, a UT student, said he's a "big fan" of rail. Even though he lives in West Campus, he decided to vote for the proposal because "we might be losing the funding if we don't pass it." Gary Malady, a real estate agent, said he voted against the proposal because it wouldn't benefit him directly. "Rail's not going to come to my house," he said. "Matter of fact, it's all in the wrong location." Malady said he wanted more money spent on roads. 7 p.m.: It will take time to tally all the votes from Election Day, but we do have early voting totals and it doesn't look good for proponents of the plan. 58 percent of early voters cast ballots against the proposition; 42 percent cast ballots in favor. There were a total of nearly 99,000 votes cast on the proposition during early voting, more votes than were cast during early voting for Mayor. This doesn't mean the proposition is dead, but it supporters will have to hope for a real turnaround from today's votes. 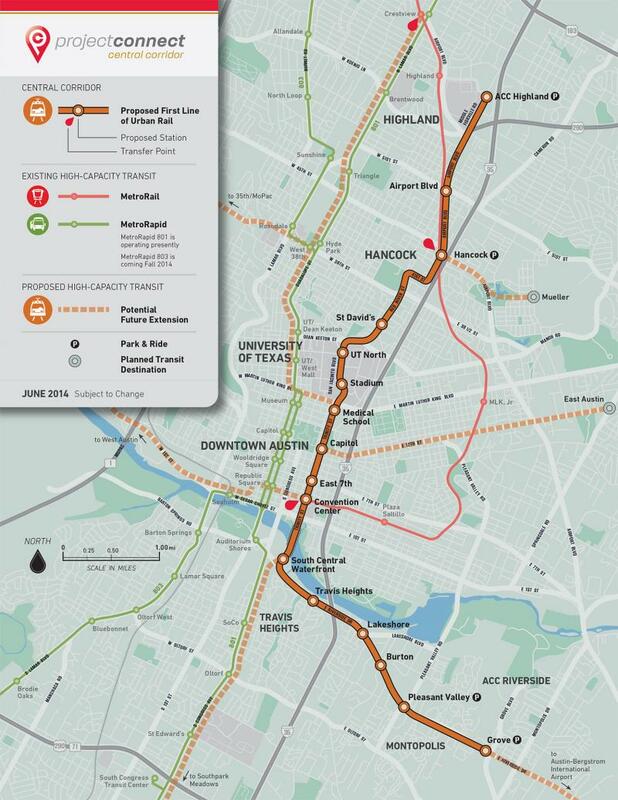 Read our full explainer on the light rail and roads proposal here. A big-ticket item on the ballot in Austin this year is the $1 billion proposal to build a starter light rail line and improve state highways in the area. 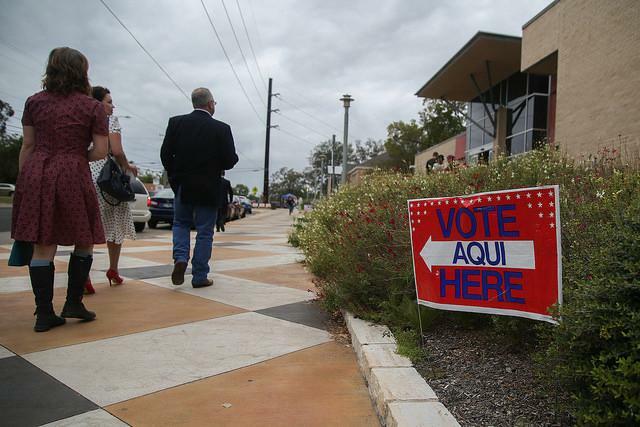 The proposition, popularly known as Austin's Prop 1 (but on the ballot listed as 'Proposition, City of Austin'), has been a matter of much debate and a perennial talking point for those campaigning in city elections. In the audio explainer below, KUT's Jennifer Stayton sits down with KUT reporter Terrence Henry, who's been covering the proposal, to talk about what's at stake, and what happens next, pass or fail.